King Kamehameha IV and Queen Emma were responsible for bringing the Anglican Church to Hawaiʻi. 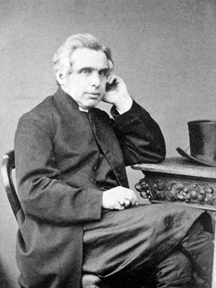 This invitation culminated in the consecration of Thomas Nettleship Staley at Lambeth Palace on December 15, 1861 as Bishop of the Missionary Diocese of Honolulu. Initially the church was called the Hawaiian Reformed Catholic Church but the name would change in 1870 to the Anglican Church in Hawaiʻi. 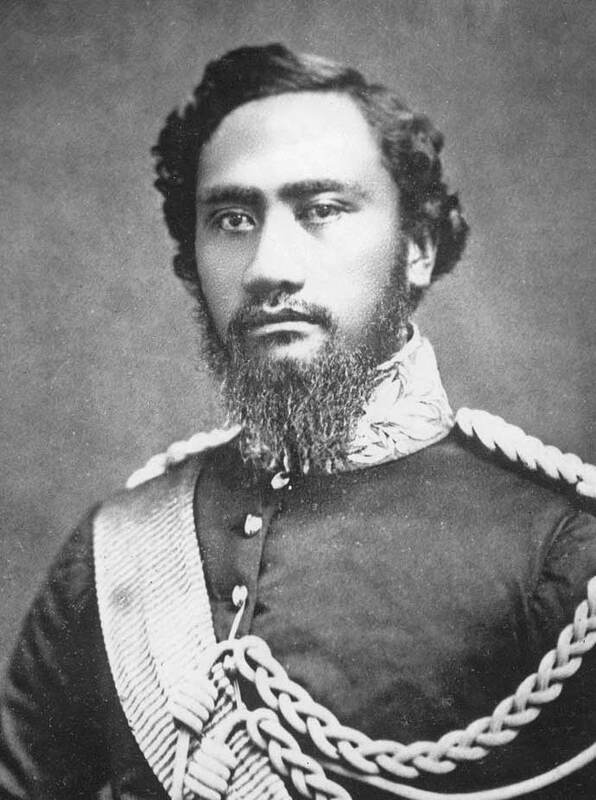 The first services of the church were held on October 12, 1862, amidst a time of mourning for the young Prince of Hawaiʻi, the only son of the King and Queen who died shortly before the arrival of the Bishop. 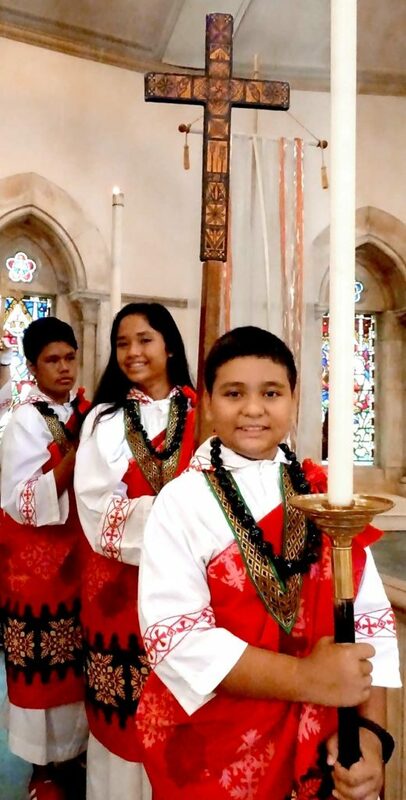 The arrival of the Bishop had been long anticipated and prepared for by the King, who had translated much of the Book of Common Prayer into the Hawaiian language and had written a Preface explaining this new Anglican Christianity to his people. The King and Queen gave land, part of their royal garden, on which the Cathedral was to be built. While planning and fund-raising began, a small Pro-Cathedral was constructed of wood; this would remain in use for more than twenty years, the time it would take for the first phase of the cathedral to reach completion. The untimely death of King Kamehameha IV on St. Andrew’s Day, November 30, 1863, led his brother, King Kamehameha V, to dedicate the cathedral to St. Andrew as a fitting memorial to a King. The Queen proceeded on her own to lead the project; she traveled to England to raise money, to commission architects, and to purchase stone from Caen in Normandy, which was shipped to Hawaiʻi as ballast in sailing ships. The first twenty years were a struggle for money, men, and materials, but with the aid of staunch supporters, the first phase of the Cathedral was completed in time for Christmas 1886, in great part because of the support for the Queen’s vision of the Cathedral as a memorial to her husband. Queen Emma did not live to worship in the Cathedral. She had died the previous year on St. Mark’s Day 1885. The King and Queen dedicated their marriage to serving the health, educational, and spiritual needs of their people. To these ends they founded The Queen’s Hospital (now The Queen’s Medical Center), several schools, including The St. Andrew’s Priory School for Girls (now The St. Andrew’s Schools, with separate programs for boys and girls) and St. Alban’s School (now ‘Iolani School), and were instrumental in bringing the Anglican church to the islands to provide access to a form of Christian spirituality that the King felt was eminently suited to the character and temperament of his people. In recognition and commemoration of these deeds the Episcopal Church of the United States honors King Kamehameha IV and Queen Emma throughout the church on November 28, the anniversary of their Confirmation in 1862. 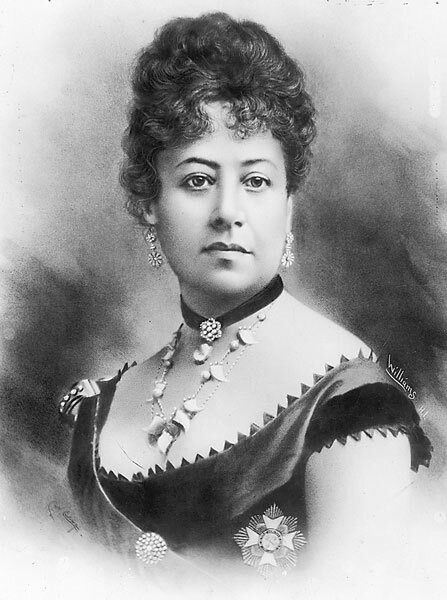 Later in the royal succession, when King Kalākaua traveled, Princess Liliʻuokalani, who had been a friend of Queen Emma, would serve as Regent. 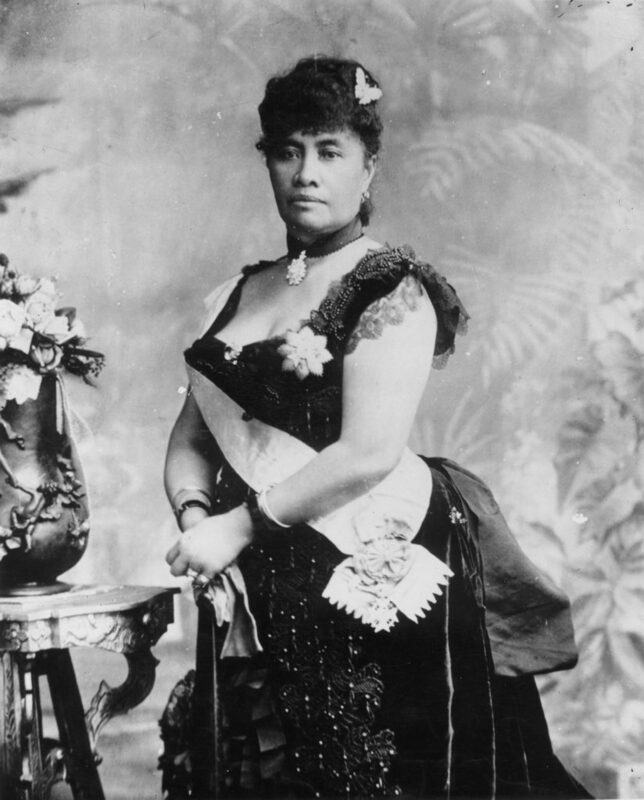 Upon the death of the King, she became queen of the Hawaiian Kingdom (January 29, 1891). When the Queen’s government was overthrown, she famously was imprisoned in a palace bedroom. She composed songs there that are still performed, still evoke memories. At Cathedral services, Liliʻuokalani always sat on the front pew. Sanford B. Dole, one of the conspirators in the overthrow of her government, sat on the opposite pew. Their reconciliation is one of the important stories of this Cathedral. Historically, there were two congregations. One congregation was at first composed of Hawaiian-speaking worshipers, and the other was composed of English-speaking worshipers. Through the early years of the twentieth century both congregations came to worship in English. The “Hawaiian” worship service evolved a more Anglo-Catholic style than that of the “Cathedral” worship service. In 1959, the separate congregations were dissolved and, of the resulting three services, the vestiges of the community of Hawaiian-speakers attended the Rite I Service with the balance distributed between a Said Service and a Rite II Service. The Hawaiian language was reintroduced at the Ka ‘Eukalikia Hemolele (Hawaiian Eucharist) in the late 1980s. Elements of the Hawaiian worship traditions have been incorporated into the Choral Eucharist. The Cathedral owes much to its royal founders and patrons and actively honors the memory of their work in celebrations throughout the church year. In 2002, the Royal Patrons Chapel (Wahi Kapu, “sacred space”) was created within the Cathedral. The chapel is dedicated to the memory of King Kamehameha IV and Queen Emma, and is a place in which one can reflect on their spiritual generosity and magnanimous accomplishments. In Hawaiian tradition, kāhili feather standards in the royal colors of red and yellow signified that the ali‘i (royalty) were in attendance. 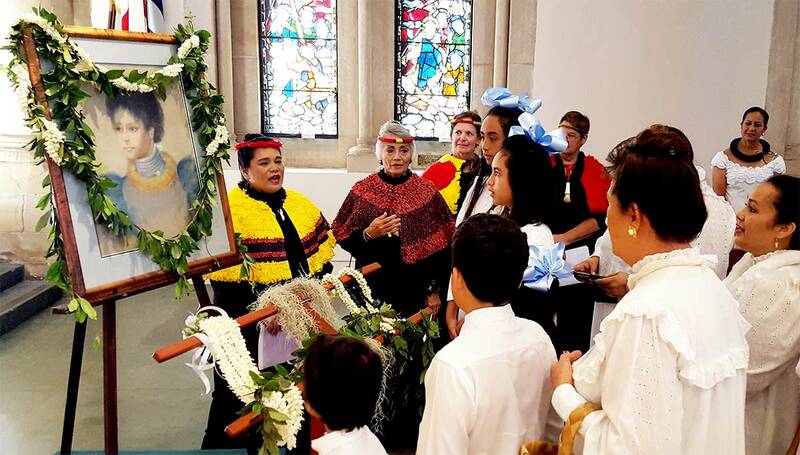 Today, kāhili at the Cathedral remind all of the royal patrons we continue to honor.